I am a little late to look at this model which is one of Oxford Diecast‘s releases to 1:43 scale from 2018. 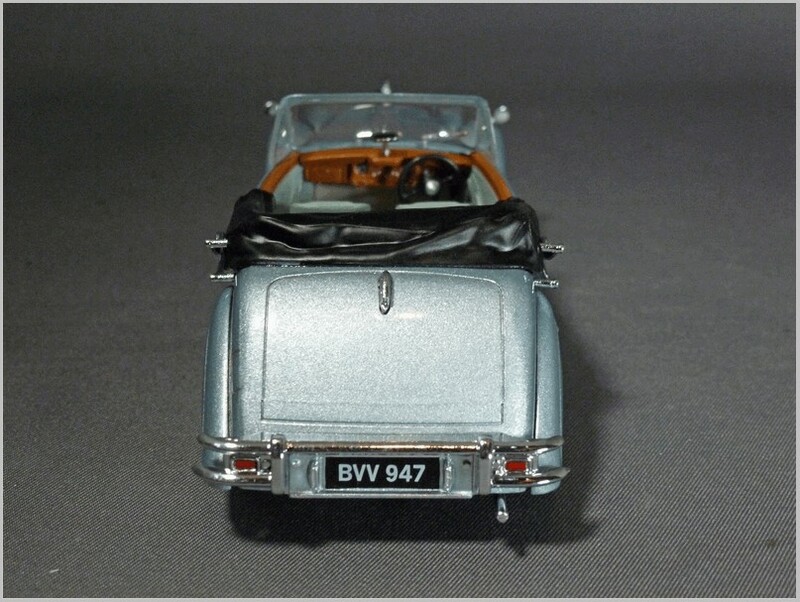 The Jaguar Mark V Drop Head Coupe (DHC) is available with top up and top down, here we show the top down release in opalescent silver. The top up versions are available in dark blue and British racing green. 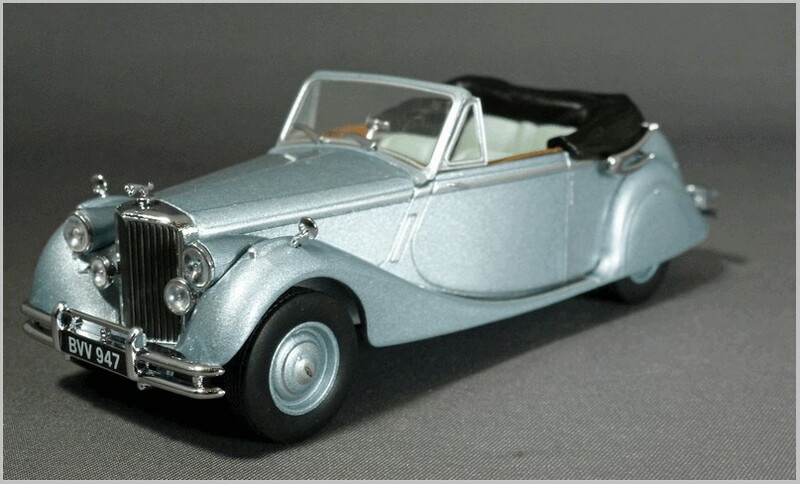 It follows Oxford’s excellent 1:43 scale SS Jaguar. 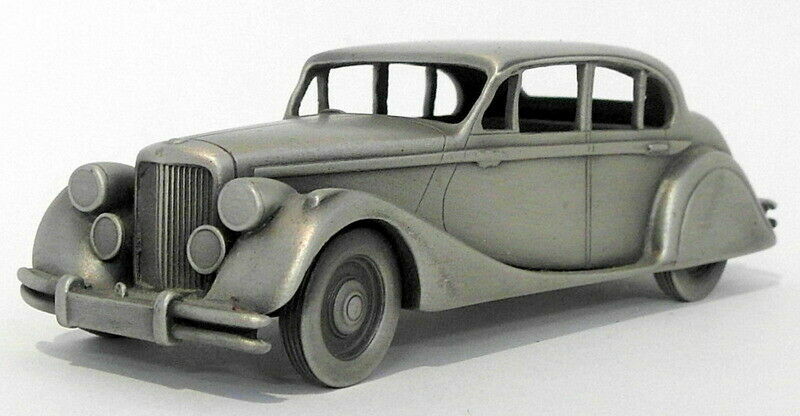 Like the SS Jaguar I expect that a version of this model will appear in the 1:76 scale range eventually. Photograph copyright of HIstoric Auctioneers recognised. The Mark V was produced from 1948 to 1951 replacing the 2.5 and 3.5 litre saloons and inheriting their six cylinder pushrod engines based upon pre-war Standard units. It was available as a four door saloon and a two door convertible known as the Drop Head Coupé, both versions being full five seaters. It was a transitional model and introduced engineering developments that would take Jaguar from being a small specialist car firm to a major player in the luxury and sports car market by the end of the 1950s. For the first time a Jaguar was fitted with independent front suspension, hydraulic brakes, and was specifically designed to be produced in both right and left hand drive. Also introduced were the classic wheels fitted with smaller 16″ tires, sealed headlamps and flashing turn signals for the important American market. It was the last car whose styling was influenced by the classic SS Jaguar lines developed by William Lyons before the Second World War. 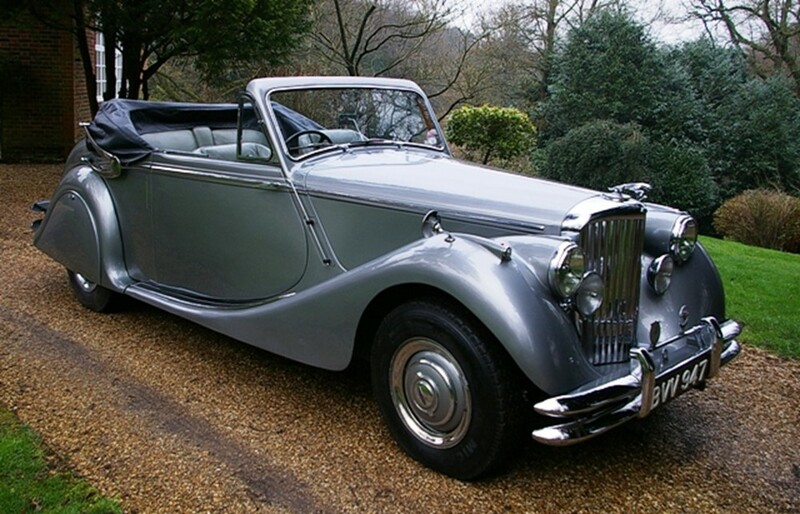 It was replaced by the more streamlined Mark VII whose style was developed from that introduced with the the XK120 and which took the large Jaguars forward during the 1950s and which not only featured integrated wings and mudguards but also the classic XK engine . 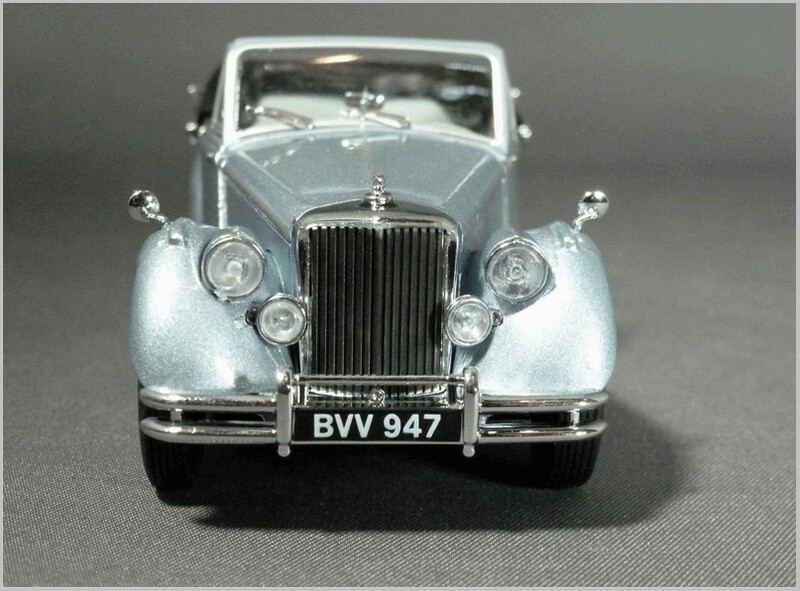 The car modelled by Oxford Diecast was featured at auction in 2014. It was built on the 1st of December 1950 and first registered on the 3rd of February 1951 by the Northampton licensing office. The model looks very true to the original car in colour and finish with the wheels accurately reflecting the Ace wheel trims, painted rims, and Jaguar details on the wheel centre. 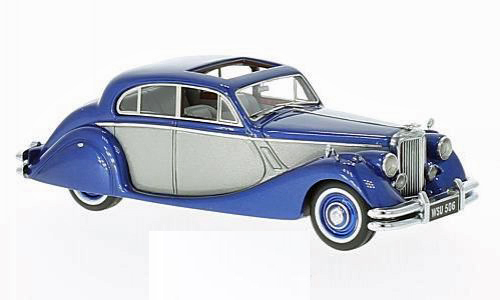 I am glad to say that this model reaches the same standards that their excellent Rolls-Royce models have in this scale. The metallic flake in the opalescent paint finish is quite fine and the overall paint finish is very good indeed. The hood irons looked too large to me until I looked at the original car and saw that Oxford has got them quite right they are huge on the real car too. The crumpled effect of the folded hood has been well realised though the plastic is perhaps a little too reflective. Door handles are moulded in and painted silver. They are so small on this car that separate items would have possibly looked over scale so I am perfectly happy with the moulded in ones. 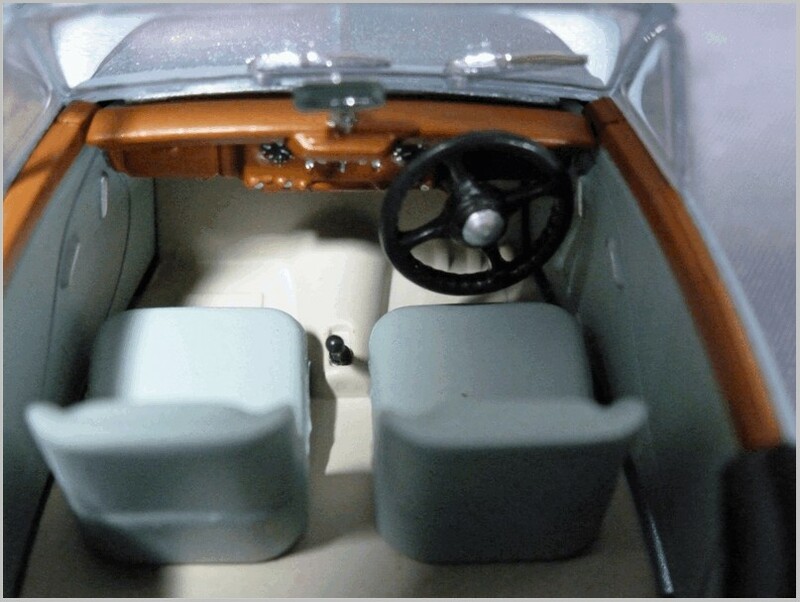 The interior is well modelled too with nice wood effect dash and door cappings. The leather seats and door trimming is nicely matt and matches the colour of the real car. Even the nice matt floor is the light grey of the original car’s carpet. One criticism is that the dash board has been rather simplified with the secondary dials and radio not shown. The grille, bumper and lights are excellently moulded and finished and the number plates are excellent. The light lenses are first class with a representation of the bulb moulded in and the chrome light rims are delicately modelled. A leaper is fitted and is quite finely modelled and does not look over scale. This was actually an optional accessory on the original car and the car this model is based on is fitted with one. There is a small gap round the main lights faired in pods, which are separate plastic items, but it is scarcely noticed at normal viewing distances so it is no real issue. The rear lights are part of the rear bumper assembly and are painted over silver background which is an effective solution. A neat boot handle is good. After a run of disappointments with some recent Oxford Diecast models this model reminds me how good they are when they get it right. 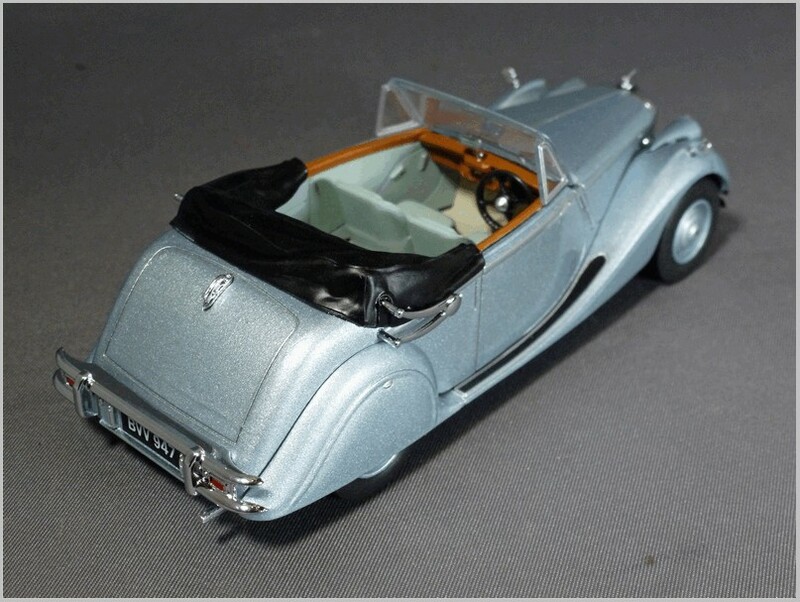 Other versions of the Mark V available include an Atlas Jaguar Collection model, made by Ixo, of the DHC with top up as shown in the photograph below. 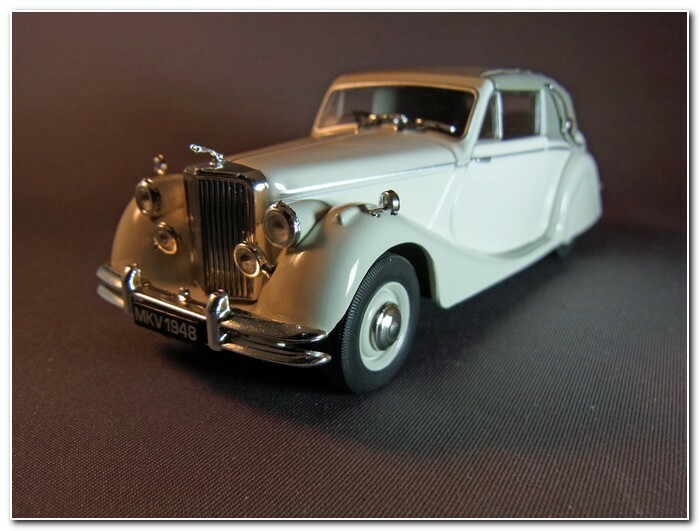 Neo produce a Mark V Saloon as shown below, a vehicle that is also available as a 1:43 unglazed pewter model by Danbury Mint also shown below. Picture copyright rights of eBay vendor recognised. Text and Photographs by, and copyright of, the Author unless otherwise acknowledged. 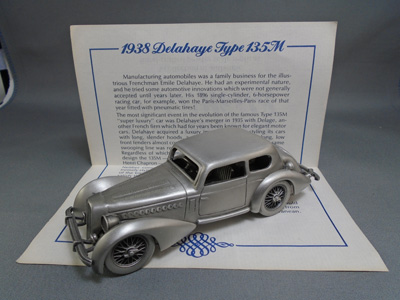 You might already know that Danbury Mint – the company known for its quality, highly detailed, 1:24 scale replica, die-cast, classic model cars – has discontinued the die-cast line of model cars due to rising production cost and retail prices, along with the closing the main factory in China, that produced the die-cast cars. 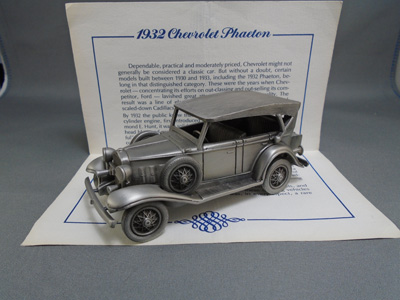 Unfortunately, this led to the decision to discontinue the die-cast model cars business. 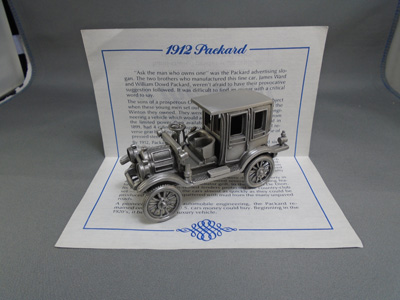 Danbury Mint was founded in 1969 and began producing the die-cast and pewter model cars in late 1970s. 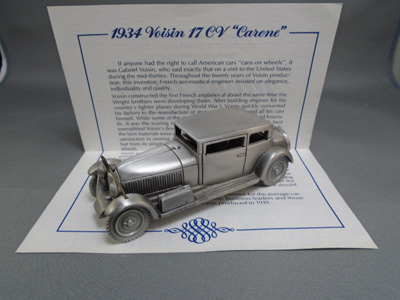 During the next 40 years the Danbury Mint produced hundreds of different vehicles in both 1:43 and 1:24 scale. PEWTER* Car Collections of Classic Sports, Rolls-Royce, Famous and Greatest Motor Cars of the World. 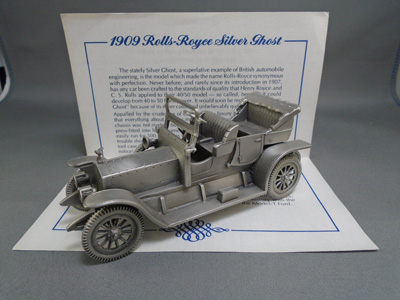 The cars were hand-cast in fine pewter, hand-crafted, and hand-assembled for Danbury Mint in England by British craftsmen. The cars in collections are approximately 1:43 scale, ranging from about 3 inches to 5 inches in length, allowing the craftsmen to duplicate authentically all details of each car, wheel spokes, hood straps, tire threads, levers, radiators, unique ornamentation, etc. The cars are true replicas of the original cars and are highly regarded by collectors for their elegance and sculptural authenticity. Issuance and cost of the cars in each collection were different – the cars of the Classic Sports cars were issued once every two months and payable in two monthly payments of $24.50. 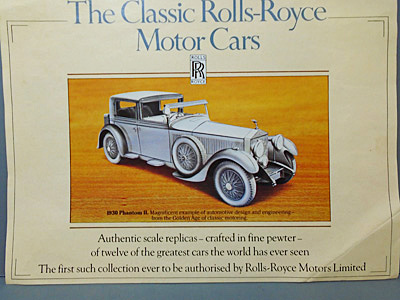 The cars of the Classic Rolls-Royce collection were issued once every two months, and payable in two monthly payments of $19.50. 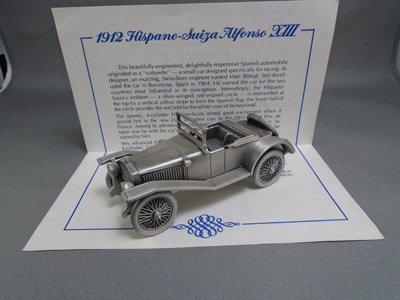 The cars of the 25 Scale Replicas of World Famous Cars were issued once every month and payable in one payment of $38.00. 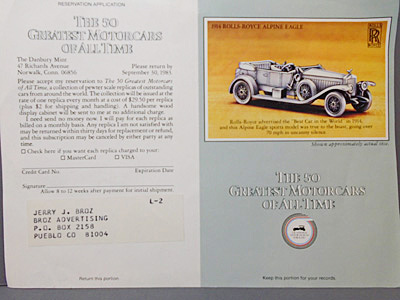 The cars of The 50 Greatest Motor Cars were issued once every month and payable in one payment of $31.50. 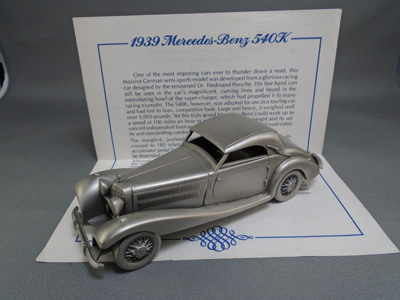 This was an exceptional value when you considered that these were hand-crafted replicas of famous cars. The hardwood display cabinet was available for each collection either at no additional cost or for a reasonable price. 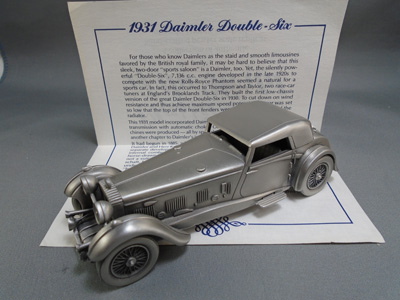 Sadly, the Collections are no longer available by subscribing directly to Danbury Mint; however, the individual cars and incomplete collections can often be found on eBay, or similar sites. 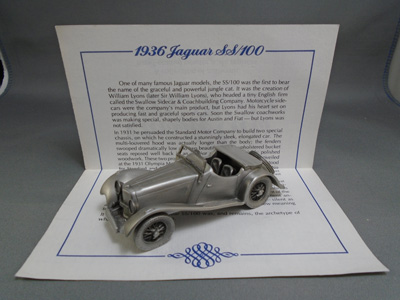 Each car in the Collections came with a card describing the history of the car. Introduction of each collection was announced with a colour photo brochure with Reservation Application form. The Collections were issued only by advance reservation. Subscribers to any or to all collections received the Certificate of Registration. 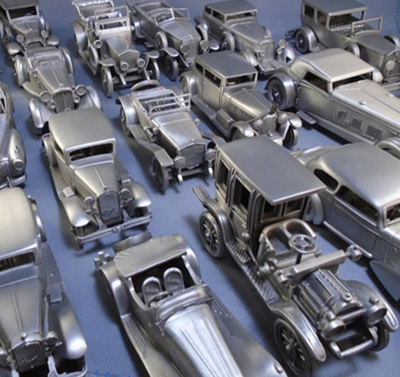 “Authentic Scale replicas of twelve American Classics Cars hand-crafted in fine Pewter”. “Authentic scale replicas – crafted in fine pewter – of twelve of the greatest cars the world has ever seen”. 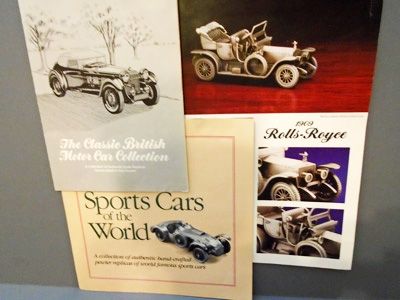 replicas of world famous sports cars”.